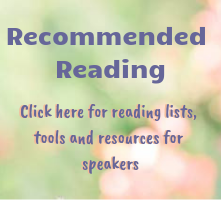 So you already have a bunch of public speaking books that tell you what to do with your hands, where to look with your eyes, and how to persuade with your voice. What you're really looking for is some inspiration, some motivation, and a behind-the-scenes peek at how the pros develop and deliver successful presentations. I've got just the book for you! 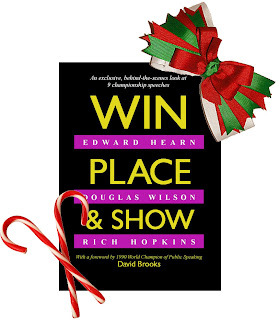 Rich Hopkins has compiled into his book, "Win, Place & Show," speeches from the top three finishers in the 2006 Toastmasters International's World Championship of Public Speaking: Ed Hearn, Douglas Wilson and himself. 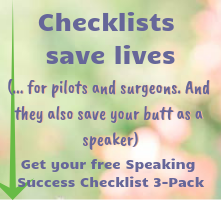 Each speaker shares the process and development of his winning District, Region, and World Championship speeches, with epilogues after each final speech to share the after-effects of their accomplishments. What I enjoyed most about the book was reading about each speaker's process. You'll be surprised to see how often these veteran speakers were creating new speeches or rewriting them days before a competition. Even veterans can get writers block! Each of us has our own process for writing, preparing, rehearsing and delivering a presentation, and the book illustrated this fascinating process, complete with sleepless nights, brutal coaches, doubts, perseverance and ultimate success. If you're a Toastmaster, you'll enjoy seeing the stage direction that's included with some speeches. I remember competing in high school with the speech team and developing intricate and detailed movements, gestures and facial expressions to accompany my speeches. For the majority of presentations you will give -- in the workplace, for example -- it would be inappropriate to develop this level of stage direction, but it does help you visualize the speech as it was delivered. The speeches are personal, sharing stories of barriers, disappointment, failure, courage, knowing oneself, good and bad choices, goals and passion: universal themes that any audience can relate to. If you'd like to give this book as a gift, Rich says you can still order by Friday and receive it by Christmas. And if you order by December 31, you'll also get a video of one of Rich's winning speeches. If you're looking for some insight and a sneak peek at how the pros do it, go get yourself a copy of Win, Place & Show.